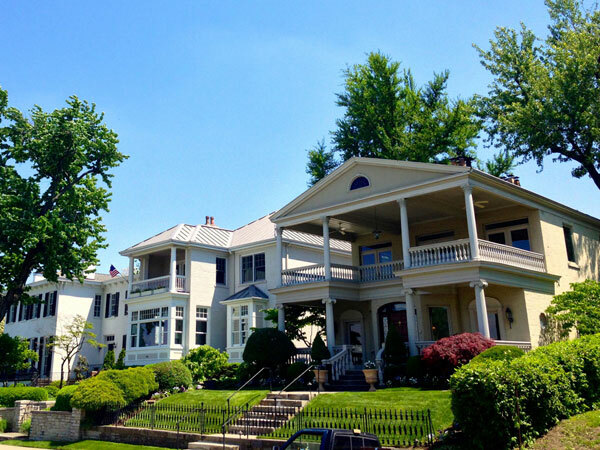 The Licking Riverside Neighborhood's original river mansions demonstrate every major evolutionary style of American architecture from 1815 to 1920. The Thomas Carneal House, the first brick house in Covington, was built in 1815 complete with a tunnel leading to the Licking River. On the west boundary sits Roebling Point, Covington's original business district. Visitors to these shops and restaurants have said, "It's almost like you're in Paris." The neighborhood is bounded by the Ohio River to the north, Licking River to the east, Greenup Street to the west, and 8th Street to the south. The historic Roebling Bridge and downtown Cincinnati as seen from Licking Riverside. Photo courtesy Andy Juengling. It is no accident that while much of the Greater Cincinnati area has given way to concrete walls, high rises, stadiums, and various restaurants and shops, the Historic Licking Riverside Neighborhood in Covington has remained largely untouched. With natural and manmade threats forever looming, a strong neighborhood organization sprouted and has remained ever vigilant. Not only have residents restored many of the houses in the district after some were divided into apartments and false facades were added in the mid-20th century, but they have remained united during the seemingly constant threat of redevelopment. Today tour buses are regularly spotted driving through the neighborhood showing off its textbook-quality architecture and shedding light on its history. All the while, residents are getting their hands dirty keeping their lawns and houses pristine. The district's north and east boundaries are defined by the Ohio and Licking Rivers. 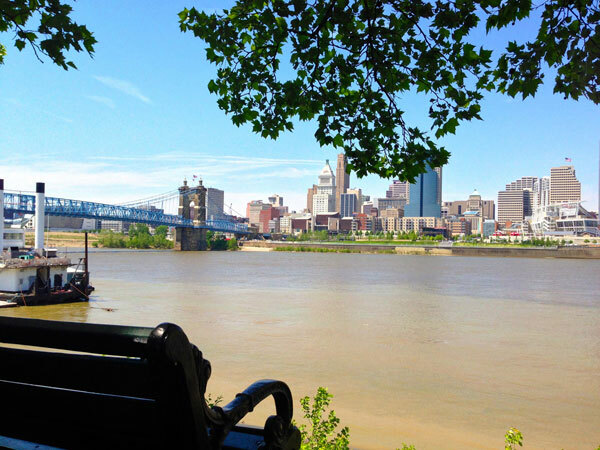 Although the rivers afford picturesque views of the Roebling Suspension Bridge and Cincinnati skyline, they are not always kind. The Great Flood of 1937 was the most destructive, causing the river to rise 80 feet and flood 40 percent of Covington. Water was up to the telephone pole cross arms along Riverside Drive, according to one account. Besides flooding, the biggest threat to the neighborhood has been commercialization. Some residents strategically bought property on different blocks throughout the neighborhood in an effort to prevent development. In 1967 and 1968, with the help of the Northern Kentucky Heritage League, residents kept the district a neighborhood by stopping a proposal for riverfront development and commercial buildings in part of the neighborhood. With the help of strong-minded residents, what was the first area to be settled in Covington is now the city's last remaining riverfront neighborhood. 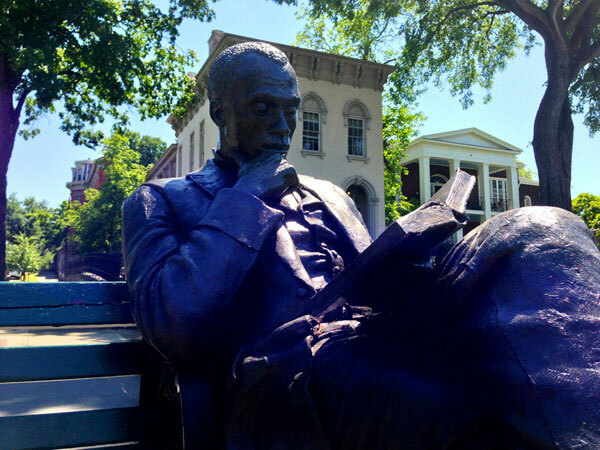 A statue of James Bradley, an important figure in the 19th century anti-slavery movement, is part of a collection of sculptures in the neighborhood. Photo courtesy Andy Juengling. Licking Riverside is the last remaining residential area along the Ohio River in Covington. Photo courtesy Andy Juengling.